I don't know about you but I love browned butter in baked goods, it gives them such a nutty, rich flavor. So, when I saw this cookies in Cooking Light I knew they had to go on the Christmas baking list. I'm kind of torn about this recipe. I like the fact the dough can be used right away & I don't need to wait for it to chill. The dough is quite crumbly & hard to roll out. It's very hard to keep the cookies together while moving them to the cookie sheet, impossible without a spatula. They smell amazing while cooking. The end result is good & you can really taste the browned butter though this is a very sweet cookie. I really like the idea of them but this may be a recipe that needs a little tweaking. Melt the butter in a small skillet over medium-low heat until dark brown, mine took about 10 minutes. Pour the melted butter into a large bowl & let cool for about 5 minutes. Add the sugar and vanilla to the butter & beat on medium for 2 minutes. Add the egg yolks & beat for 1 more minute. Mix the flour, salt & baking powder together then add to the batter. Mix until just combined. Turn the dough out onto a sheet of wax paper & gently knead about 7 times. Roll out until 1/4-inch thick. Cut into shapes, re-rolling scrapes as needed. Put the cookies on a baking sheet lined with a silicon pad or parchment paper. Bake for 10 -12 minutes until the edges are golden brown. Let cook a few minutes on the pan before removing to a rack to completely cool. The recipe says it makes 32 2 1/2-inch cookies. I got 17 3 - 4 inch cookies. Whisk all ingredients together until smooth. Add more half & half as needed to get a spreadable consistency. Ice cookies once completely cooled. How cute are those cookies. Don't you hate when a recipe falls short but has so much potential. Browned butter brings in such wonderful flavor, doesn't it? These are so pretty! I'm not a huge fan of cut out cookies because of the reason you said--moving them over to the sheet, and rolling out the dough. But I once read a tip: if you're using a flat sheet w/ no sides, you can roll the dough right out on it, cut out the cookies on the sheet, and just remove the scraps. Or place your rolled out dough (that you roll out on parchment) right on the sheet and proceed from there. Iced cookies are so good! Thanks for the parchment tip Elle, I'm going to try that. I was eyeing that recipe in Cooking Light--love the idea of browned butter in a simple cookie. Was thinking of doing it w/my 3-year-old, which now seems like a bad idea. Thank you for test-driving it! I, too, love the sound of the browned butter in these. Too bad they weren't perfect, but at least they were good! 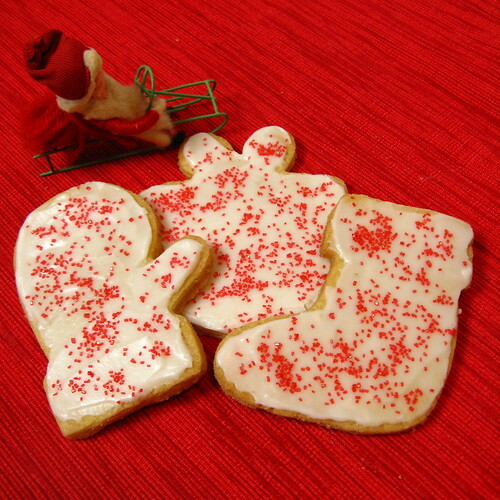 very few things are superior to an iced sugar cookie during the holidays, but i daresay these would be. lovely work! Wow, these look yummy! Good work. We should make ours soon! I'm not usually a huge fan of sugar cookies (too sweet without enough flavor) but using browned butter seems like it would up the flavor factor. I'd be interested in hearing about your tweaks if you make this recipe again. I made a similar cookie and once the dough was finished, even though the recipe didn't suggest chilling it, I did anyway. The dough was as you described, very crumbly etc. but with a few hours chill time, it worked better. I shaped it to logs and sliced them. Way easier. Just not as cute. I'm glad to see you tried these. I've been looking at them myself. Elle has a great tip that I will have to try. I'm still considering making them myself - so to have your review of them here is helpful!